Stems stout or slender, erect, simple or somewhat branched above, smooth or slightly pubescent, 11/2 to 5 feet tall, usually several stems from a perennial root. 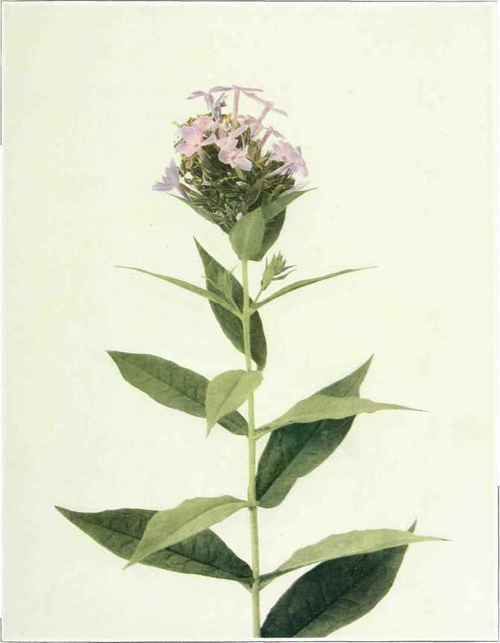 Leaves opposite, entire, thin, oblong to oblong-lanceolate, long pointed at the apex, usually narrowed at the base, 2 to 6 inches long, one-half to 11/2 inches wide. Flowers in dense, terminal, paniculate clusters, forming an inflorescence 3 to 12 inches long; calyx with five small, slender teeth; corolla pink, purple or white, about an inch long, consisting of a slender tube and an expanded limb with five obovate lobes, the limb one-half to two-thirds of an inch broad. Fruit a small, oval, blunt capsule. In woods and thickets, native from Pennsylvania to Illinois, south to Florida, Louisiana and Kansas. Common in cultivation. Freely escaping from gardens, and established in the northeastern states. In cultivation consisting of many varieties, differing in leaf form, size and color of flowers and in pubescence. Flowering from July to September.